AML stepper motors are specifically designed for use in UHV environments making them ideally suited for low speed precision in-vacuum manipulation without the use of particle generating motion feedthroughs. 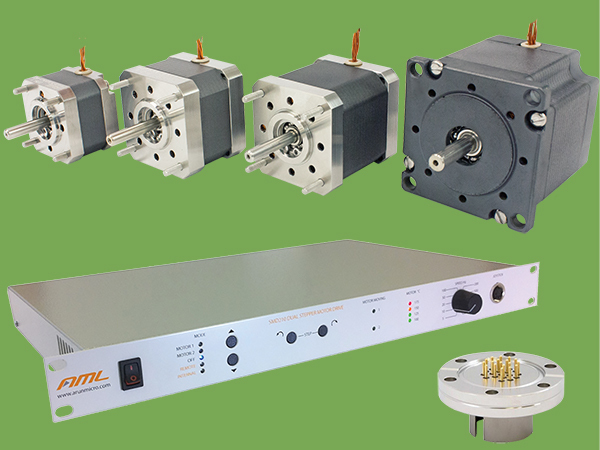 The considerable reduction in mechanical complexity, absence of metal to metal sliding surfaces and low outgassing characteristics make these motors especially suitable for sensitive handling applications.The model D motors are two phase hybrid stepper motors, available in a range of standard sizes and torque ratings. Standard motors provide 200 full steps per revolution and are suitable for use between -65°C to +175°C. Extended low temperature range (-196°C) versions, radiation hard versions (1 x 107 Gy), shaft modifications and hybrid bearings are all available options. All motors are designed, cleaned and hand assembled to UHV standards in an ISO Class 7 cleanroom. • UHV compatible materials, suitable for use below 1 x 10-10 mbar. 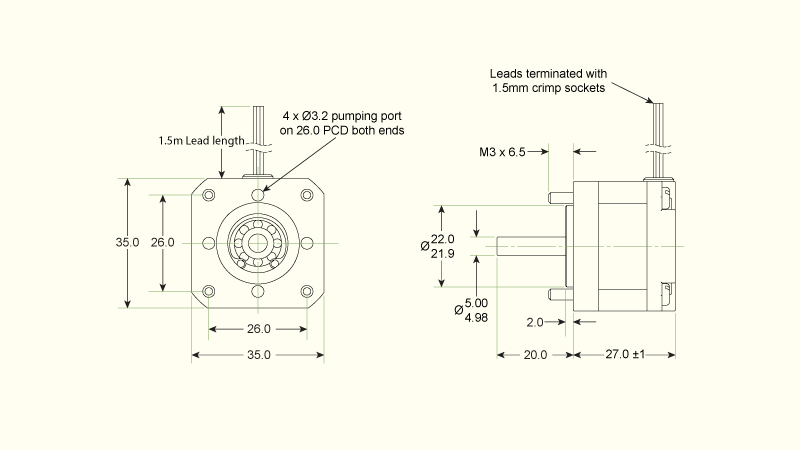 • Continuous in-vacuum operation with M-SMD2 controller. • Long life bearings with very low particulate generation. • Custom / Radiation hard versions available. Standard motors are fitted with open stainless steel bearings lubricated with NyeTorr® 6300 UHV grease. Option ‘H’ motors have hybrid bearings with silicon nitride ceramic balls, dry lubricated with molybdenum disulfide. Please call our sales office to discuss your requirement for motor options. 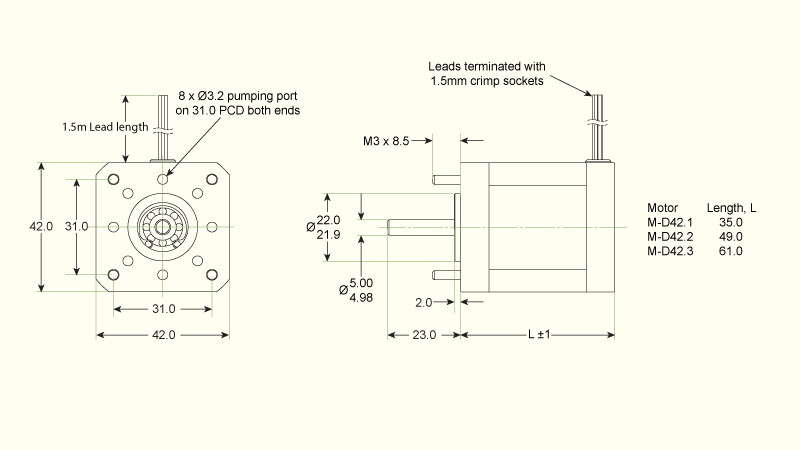 Drives 2 UHV stepper motors sequentially. 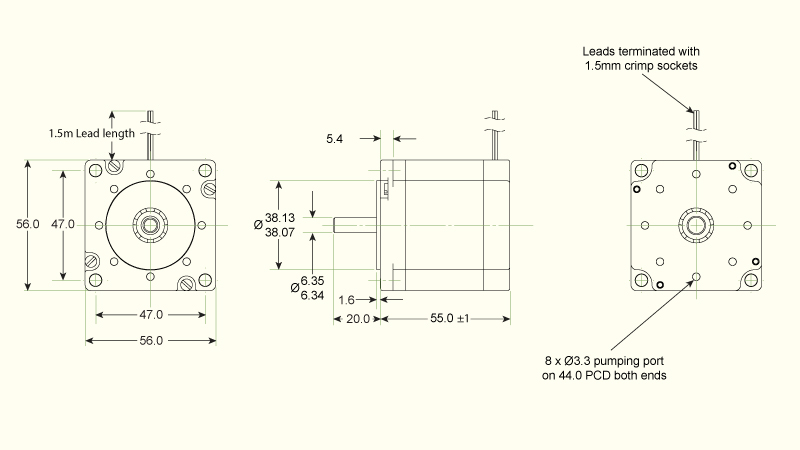 Advanced low-power drive techniques for minimum motor temperature rise and outgassing and maximum operating time. Phase currents can be set from 0.1 to 1A in increments of 0.1A. Holding torque can be controlled independently of dynamic torque under program control, to reduce power. Thermocouple amplifiers (type K) for motor temperature indication, protection and control of motor bakeout. RS232C interface for host computer control. Drive programs can be developed and run from the computer console (Remote Program Control) or downloaded for stand-alone operation (Internal Program Control). Motors may be operated manually with the front panel ‘STEP’ switches or with a joystick. Single-step or multiple-step operation with smooth acceleration to the selected speed. 3 user inputs for interaction with program execution, in addition to two “End of travel” inputs for each motor. 3 user outputs for switching under program control. Simple control language has many powerful commands which allow control of all aspects of motion or position. Conditional operation, loops and jumps are possible. 1U high full-width, steel-cased instrument for easy rack-mounting. Operates from 100 to 240V, 50/60 Hz supply.